Deep in extra innings in this August 1993 game, the Marlins needed to send their reliever Richie Lewis to the plate, according to The Associated Press. As it turned out, Lewis hit as well as a pinch-hitter: He drove in the winning run on a single to left. "I know it may sound a trifle trivial - a pitcher wanting to hit and everything - but I've been a three-sport athlete all my life," Lewis told The AP after picking up the win. "If you're going to be out there and have to hit, you might as well get out there and get the most of it." Lewis picked up that game-winner in his second season in the majors - his first with extended time. He went on to see time in seven big league seasons before his career was out. His career ultimately spanned 16 seasons, finally ending at AAA in 2003. Lewis' career began in 1987, taken by the Expos in the second round of the draft out of Florida State University. He went to Florida State out of high school in Muncie, Ind. With Florida State in June 1986, Lewis pitched his team to a College World Series victory against Miami, striking out 10. "Really the whole thing was Lewis," Miami coach Ron Fraser told The AP afterward. "He was the whole ball game. We had them on the ropes a few times, but he came back and struck us out." 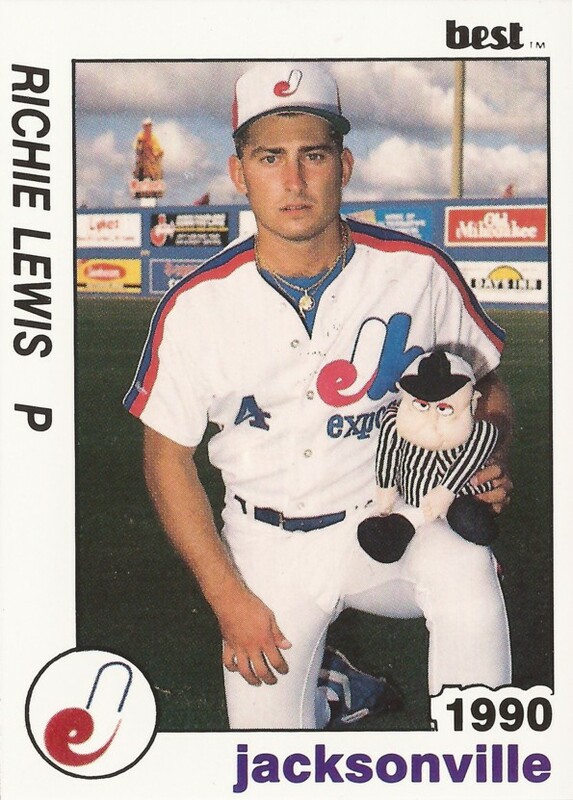 With the Expos, Lewis saw his first pro time all the way up at AAA Indianapolis. He saw two games there. He then returned for 1988, 1989 and part of 1990 at AA Jacksonville. He moved to the Orioles mid-1991 and he played all of 1992 at AAA Rochester. He also saw two games in Baltimore that July, giving up eight earned in 6.2 innings of work. Lewis' big major league break came in November 1992 as the Marlins selected him in the expansion draft. He then played all of 1993 and 1994 in the bigs with Florida. He got into 57 games for the Marlins in 1993, posting a 3.26 ERA. He then got into 45 more in 1994, with a 5.67 mark. Lewis moved to the Tigers in 1996. He got into a career-high 72 games, turning in a 4.18 ERA and saving the only two games of his career. He then played 18 games between Oakland and the Reds in 1997 and two with the Orioles in 1998, finishing out his big league career. Lewis then continued to play in the minors through 2003, even seeing a stint in Korea. He also turned to starting in trying to get back to the bigs. In 2001, with the Mets at AAA Norfolk, he worked to get enough innings in for a win over a rain delay. "The only way I can get out of a game is to pitch my way out of it," Lewis told The Newport News Daily Press. "I felt really good, especially in the fourth inning. Maybe I should find a way to get an hour off between innings every time out." His final pro time came at AAA Edmonton in 2003 with the Expos.